Arial, a contemporary sans serif typeface by Robin Nicholas and Patricia Saunders designed for Monotype in 1982. If you are familiar with a computer you must know Arial, one the most used “standard” typefaces for “normal” computer usage. Most professional designers and typophiles think of Arial as a copied typeface from Helvetica and while reading the The Scourge of Arial by Mark Simonson Studio I have realized this is in fact a true story. 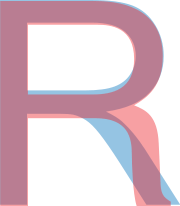 The typeface became free with the release of Windows 3.1, which was a sales hit and Arial quickly gained spread around the globe. The main reason why Microsoft chose Arial as standard typeface is because of the license fee from the original Helvectia typeface by the Haas Foundry was too high. Missed change to educate the world about the wonderful Grotesk family. There are several glyps of the typefaces similar and some of them are different. Due the similarity Arial is often (unfortunately) mistaken for Helvetica, the differences between these two typefaces is explained in an article on iLT, both typefaces are shown next to each other making it easier to recognize. 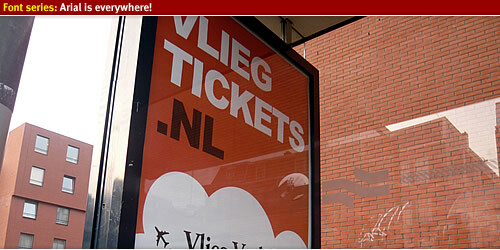 Passing by an advertisement by a Dutch website about flight tickets, noticed the Arial Black at the top, when visiting the website also all other text is designed using Arial. 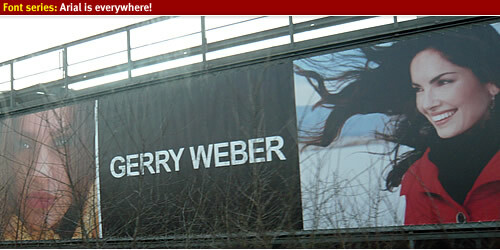 Driving on the highway when I spotted the Arial here in this advertisement, it seems to be an German clothing company using Arial for their logo, the payoff of Gerry Weber seems to be in a Futura. 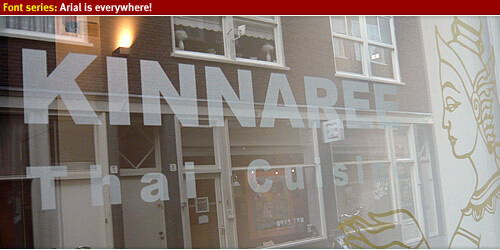 Love the Thai cuisine and went to this small restaurant in Amsterdam, the window signs and menu is done using the type Arial Black. 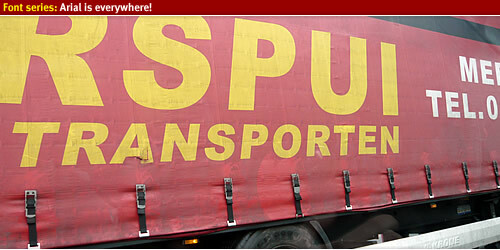 Another highway shot taking while driving… Here is a clear usage of Arial Black italic for the logo and text. 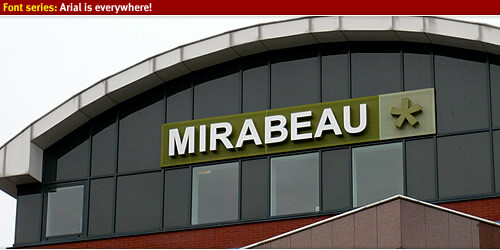 A large Dutch internet company is using Arial for the illuminated signs, at first I was mislead, Mirabeau* using Arial? 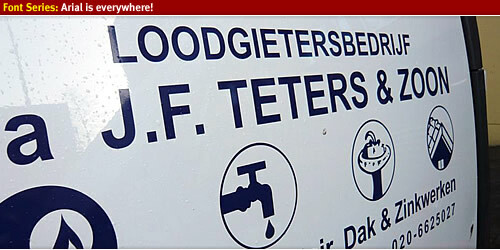 I only really recognized it by the letter “R”, visiting the website it seems they have changed the typeface of the logo. Throwing away old stuff… And found a small travel raincoat. Used typeface Arial Black. 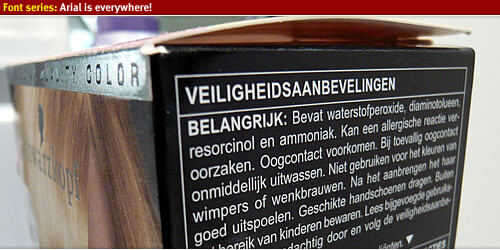 Say again… Swarzkopf is using Arial? My wife bought something to color hair and while brushing my teeth I couldn’t believe my eyes. 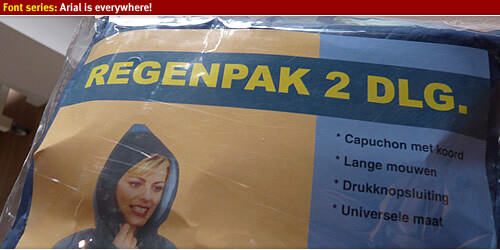 Quickly went to the store and yes… Swarzkopf is using Arial! Yet another large company is using Arial, this time I found a print on my wife her shoebox all lettering is using the typeface Arial. 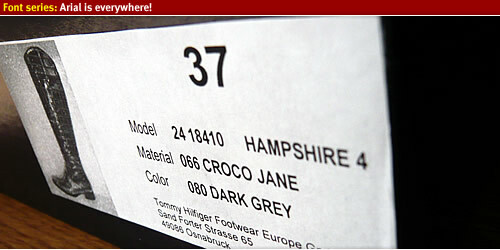 This is actually one of the few brand where they consistently use Arial for all their visual communications. 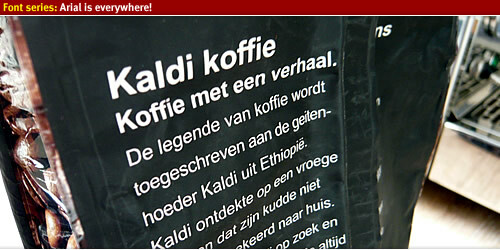 This Dutch Coffee shop uses Arial for their logo, text and shopping branding. Waiting for the light to turn green, just had enough time to take this photo. 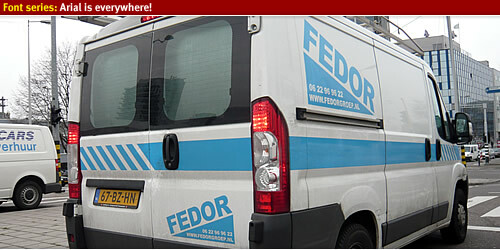 This van has some lettering done using typeface Arial. 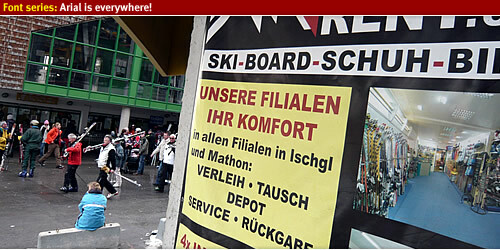 Went skiing about two weeks ago and never have I seen that much usage of Arial. 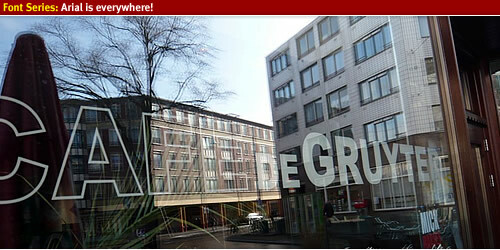 Here the hotel used Arial for the name of the hotel and the text. 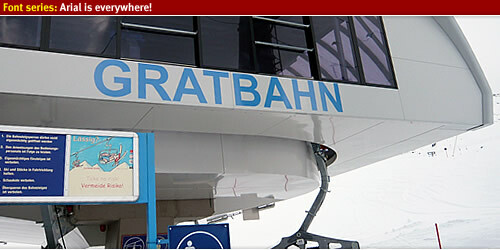 Most of the ski lift in this area (Ischl, Austria) uses Arial as typeface for the name of the ski lift. 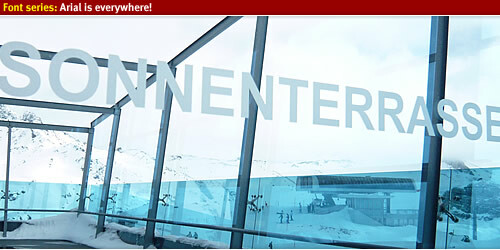 Unfortunately we didn’t have a sunny weather, but when there is you can visit the sun terras. 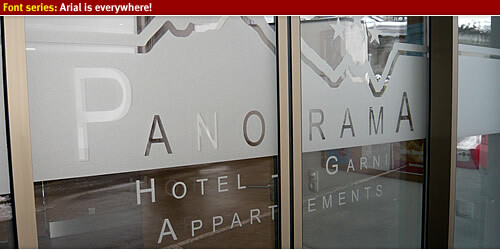 On the doors is placed with etch foil the text “Sonnenterrasse” in German language. This shop used Arial for all the visual communication, not to mention that in this small village there where three of these shops… Arial is everywhere! Getting back and filling out some forms for the government, in Holland there are ways to fill out forms using a digital signature, called DigiD. I noticed the usage of Arial at the top of this letter. 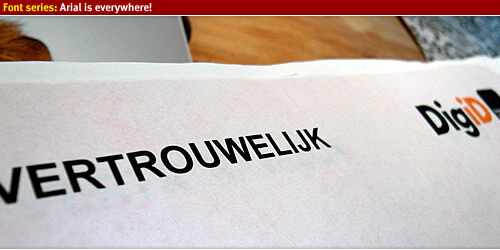 Hopefully this will change towards to new brand identity of the Dutch government. 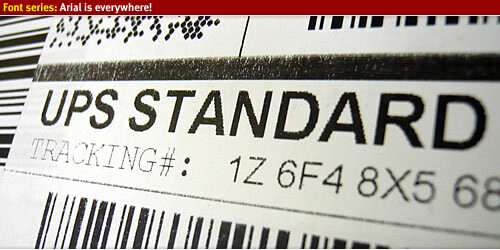 The packages send using UPS are using Arial on their sticker, all information is printed using Arial. 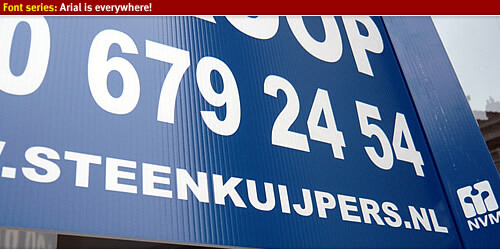 Due the credit crisis many houses are for sale in Amsterdam, the broker puts op V-shape signs with the information “For Sale”, this broker also uses Arial Black for their name. 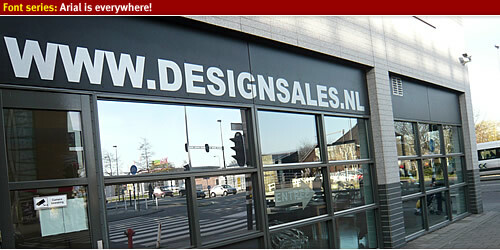 Everyday I drive pass by this furniture shop in Amsterdam, the sell luxury design furniture, but all the typeface use is Arial Black. 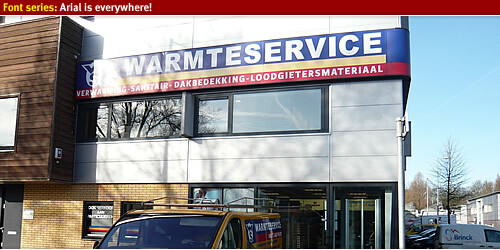 This is a large pluming company is Amsterdam, they use Arial Black for their logo and other forms of visual communication. 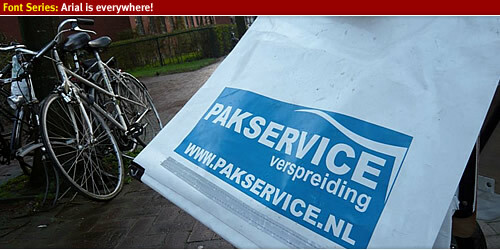 Walking down the streets and spotted this printed bike bag which they use to distribute flyers, typeface used Arial. Spotted this one many, many, many times. 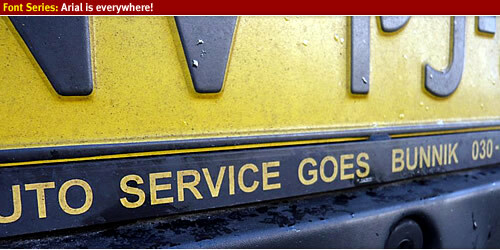 A license plate holder for Dutch cars, most of them use Arial to display the name of the garage. This plummer company uses Arial for their logo and text, designed with icons. This local cafe uses Arial Black for their logo on the window, also the opening hours and other text is displayed in Arial. Look around and you'll spot Arial around you! Arial is everyyyyyyywhere! !